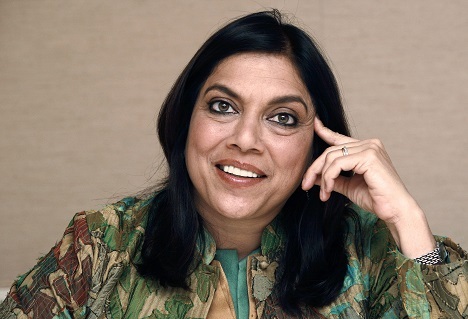 In an interview with Lenta.ru in St Petersburg, acclaimed Indian-origin director Mira Nair talks about filmmaking in India, political and non-political art and her interest in Andrei Tarkovsky films. Mira Nair was a guest at the Message to Man film festival, which took place in St. Petersburg at the end of September. The India-born director found fame with her first full-length feature film, Salaam Bombay, which received an Oscar nomination and several prizes at Cannes. Her latest projects include a film about aviation pioneer Amelia Earhart and an adaptation of the book The Reluctant Fundamentalist, which deals with the aftermath of Al Qaeda’s terrorist acts in the US. Lenta.ru met up with Mira Nair in Petersburg and talked about filmmaking in India, émigré life in New York, and political and non-political art. You were born in a small town in India and lived there for the first 18 years of your life. Do you remember the first time you watched a movie? There weren’t any cinemas in the town where I grew up, and so we would travel to watch films. Our nearest big town was Calcutta. The first film I saw there was Howard Hawks’ Hatari with John Wayne in the main role. The story revolved around an African safari. But I should say that cinema was not the most important feature of my childhood. I was much more interested in Indian traveling theatre, where the performances were based on religious discourse. That is what I was really interested in. When did film start to become really important for you? It was probably when I was about 19, when I went to study in America. It was then that I first really became fascinated by cinema. I watched a lot of movies there for the first time – including Indian films, which of course sounds quite strange, but that is how it was. And when I was 21, I had something of a Eureka moment. It dawned upon me that I wanted to shoot films myself. But having said that I still came to film through theatre, where I was, among other things, an actress. And what I didn’t like about being an actor was the lack of control over what was going on. I always had my own vision and ideas about how things should be. Today Russian cinema exists within a framework of a certain deep-rooted system – a system that is often dependent on the state or on the corruption, laziness and unprofessionalism of the people working in it. To make a really good film within this system is no mean feat. When you were shooting your first feature films did you feel that you were going against the system and the established norms of Indian cinema? That’s absolutely correct, and so I can’t even describe how difficult it was. Part of the money for my first film, Salaam Bombay, was subsidized by the state, and back then I still didn’t understand what I was getting myself into by accepting this. Things have changed a lot since then, but at the time we had to report on everything we had spent every week, and the money was given to us bit by bit, every seven days. This bureaucratic system was geared towards one thing – to break people’s spirit. But looking back, it was this system that formed me and made me the person I am today. Being a film director entails a constant battle with oneself and with ones surroundings. Having received world-wide recognition following the success of your debut film, did work get any easier? Salaam Bombay really was incredibly successful both at festivals, where it won all sorts of different prizes, and commercially when it was released all over the world. This was the first Indian film to enjoy such a wide circulation across the globe. So, from a financial point of view at least, the second film was much easier to make. No one placed any limits on us. But first we had to choose the right story, and decide exactly what it was we wanted to say. This proved difficult, because in Hollywood I was offered opportunities to be involved in a huge number of quite monotonous-looking projects. Luckily I was brave enough to turn these down and to make my own film. For most of your career you have made films about day-to-day life in India and, for example, the Kama Sutra. At what point did you become interested in politics? The interest started back when I was working in theatre. I once asked myself the question – can art change the world or even influence it? Never mind to what extent. If so I was determined to be involved with this sort of art. And what was the conclusion you came to? It turned out that the answer to this question is yes. We used the money we received from the Salaam Bombay royalties to build a special centre for street children. The centre has been functioning for twenty five years, all thanks to the film. Each year the centre caters to five thousand children. And gradually it has changed the state policy on homeless people. I don’t know whether every film would be able to have such an effect on the real world, to change people’s attitude towards themselves and towards their surroundings, but if this were possible I’m sure our lives would be better. And what do you know about Russian cinema? Do you have a favourite film or director? I’m afraid I’m not able to name anyone apart from (Andrei) Tarkovsky. His film Ivan’s Childhood is what impressed me the most. I have never seen a portrayal like that, and the film is shot in a really unique way. The sliding camera, zoom-ins on a child’s face, the horrors of war in the background - all this combines for a spectacular overall effect, I can only really compare it to hallucinations. When I first saw this film I immediately wanted to watch it again. And then I saw the rest of his work, Stalker, Solaris, but Ivan’s Childhood really struck a chord with me. Andrei Konchalovsky’s debut, First Teacher, also stands out for me.